Decades before pastiche became a respectable genre, when there was no track record of out-of-favour rock bands regaining artistic credibility, Marc Eric Malmborg channelled Pet Sounds into his career-killing debut album. Maybe he just wasn’t made for those times. In a blink-and-you’ll-miss-it career that ended before his 20th birthday, Malmborg pursued his devotion to counter-cultural America’s sitting duck – The Beach Boys – to the nth degree, crafting a sincere, if gauche, musical love-letter to Brian Wilson that died upon its August 1969 release. Cut-out bin purgatory is the lot of most one-album artists, but the critical re-evaluation of The Beach Boys that began in the early ‘90s has unearthed a few diamonds in the rough, including Malmborg’s A Midsummer’s Day Dream. Showing early songwriting promise, a 16-year-old Malmborg (who dropped his surname for professional purposes) could be found demoing songs at L.A.’s Gold Star Recording Studios with Wrecking Crew session players laying down the basic tracks. A spiritual Wilson connection was later forged when The Four Freshmen, the antecedents to The Beach Boys’ vocal sound, recorded one of his songs. Malmborg was green-lit to record his own full-length in early 1969. Midsummer’s strength lies in the details: the tunes are good, but the sound’s incredible. A soft-focus filter envelopes every song in a glaze of reverb and space, a quixotic effect that works like a trawl through someone else’s yellowing summer holiday pictures. That dreaminess is neatly mirrored by Malmborg’s multi-tracked singing voice, keening and slightly flat, but made all the more affecting by dint of its earnestness. He plays the ingénue throughout, homesick on the opening “California Home,” bewildered by sexual awakening on “Laura’s Changing” and “Where Do The Girls Of The Summer Go?” and beset by youthful insecurities on…just about everything else, actually. For fans of a certain type of pillowy ornateness on the order of Pet Sounds, this record is manna from heaven. The most Pet­-sounding songs, “Take Me With You,” “Don’t Cry Over Me” and “Sad Is The Way That I Feel” are heartbreakingly lovely, and the modest rock drive behind “Move With The Dawn,” “Night Of The Lions” and “We Live So Fast” is tastefully restrained. Besides, the musicianship is faultless and the kid can really write a hook. And the roaming basslines, vibraphones and French horn leads are totally School Of Wilson. It’s not hard to hear A Midsummer’s Day Dream as a natural successor for Pet Sounds, if Wilson’s creative ambition had peaked there. Where Wilson sought to expand rock’s vocabulary in his one-upmanship battle with The Beatles, graduating to “Good Vibrations” and Smile, Mark Eric’s Johnny-come-lately effort is the work of a romantic sentimentalist, an 18-year-old on the cusp of manhood, blithely aping his hero’s signature moves in the grip of artistic puppy love. In this light, Midsummer is in fact very much like a daydream on a hazy, drowsy, late-August afternoon, where you can pass for someone else if the lighting’s right. 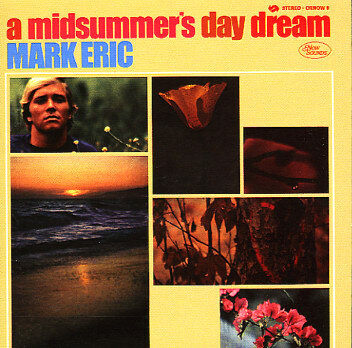 As of December 2010, A Midsummer’s Day Dream is available on Now Sounds.